Kirk Franklin joined the Chicago artist for “How Great” and “All We Got” from Chance’s Coloring Book project. Chance the Rapper has already notched the first three Grammy awards of his career at the 59th Annual Grammy Awards. As the night came to a close, Chance took the stage alongside gospel singer Kirk Franklin to perform "How Great" and "All We Got" from his Coloring Book project. The 2017 Grammys mark the first time that streaming-only releases, like Coloring Book, are eligible for consideration. 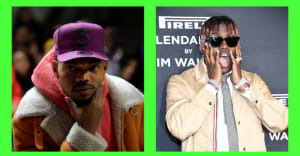 In addition to his nominations for Coloring Book, Chance also earned nods for his contributions to Kanye West's "Ultralight Beam" and "Famous." Watch Chance the Rapper's performance at the 2017 Grammys above.